At night time, there is a white faced heron (or maybe more than one) who hangs out on the teeny beach that is squeezed between the Opua General Store and the wharf. 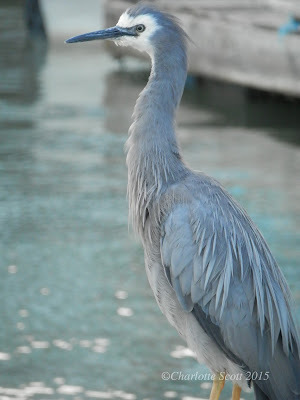 He or she (they aren't easy to tell apart) fishes in the light cast from the street lamps that line the wharf. I spot him sitting on the poles that were historically used to careen boats, or stalking silently and measured through the shallows, or hear him croak as he flaps slowly off when we have surprised him as we walk the dog. 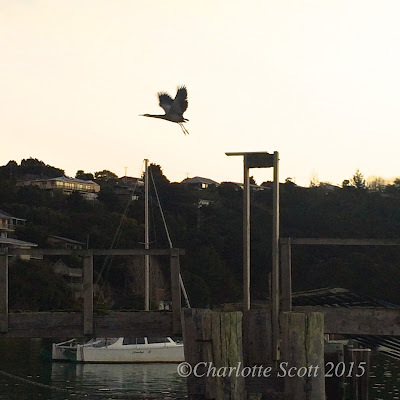 And so, herons are influencing my work more than a little lately. They are making their graceful, watchful way onto my design wall. This smaller work is 12" x 24" and is titled 'With Little Noise'. It's named so because the time of night I usually see my fishing friend is that quiet time when the car ferry has stopped, the streets are dark and everybody else is in the warm and light inside. I've tried to convey that dark, restful aesthetic with this piece. The simplicity of it reminds me a little of Japanese work. The grey ombre fabric, the stems and the binding are my hand-dyed fabric, the rest are commercial batiks and a commercial solid. 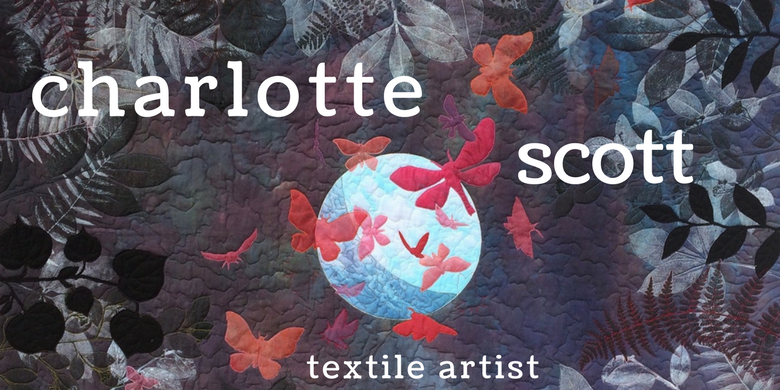 And as always, I'd love to hear your feedback and what the quilt makes you think and feel. Well, we are open for business! 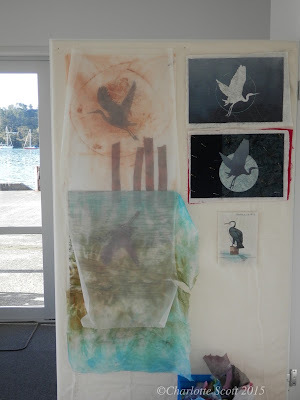 One week ago exactly, I was pouring glasses of wine, smiling fit to burst and welcoming everyone to Opua Arts. It was a great little opening; we had a brazier going outside, live music provided by one of the artists, wine, nibbles and lots of enthusiasm. I couldn't have asked for more. This is the view from upstairs. Here I'm hoping to have classes, sit and stitch evenings and other community art gatherings. When it's sunny it's divine, but even when it's inclement there is always something happening on the wharf to watch. 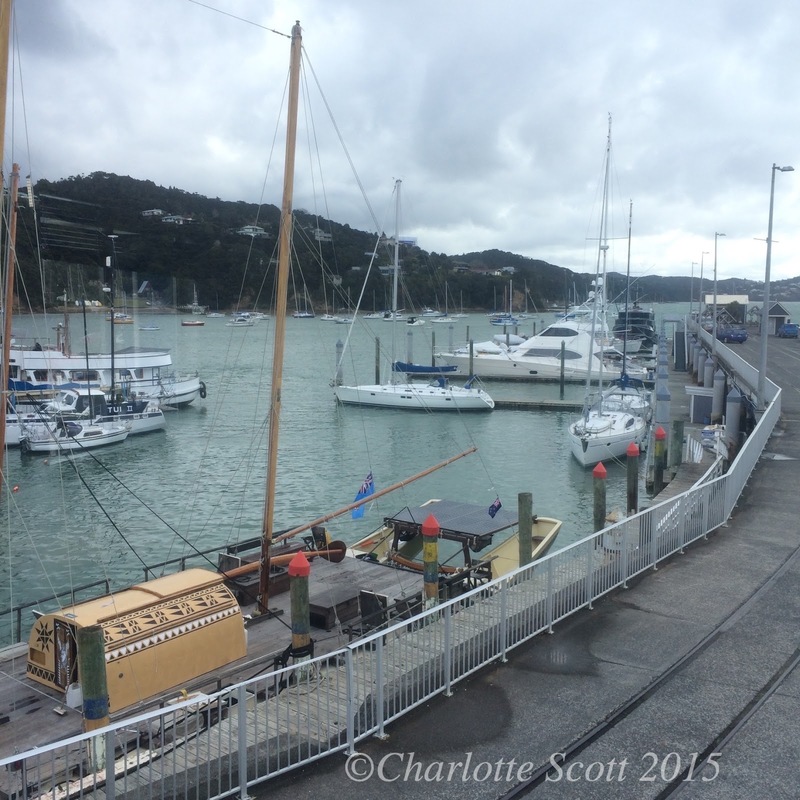 Can you see my boat on the right hand side of the picture? I couldn't help admire the sun and shadows falling across this grouping above. 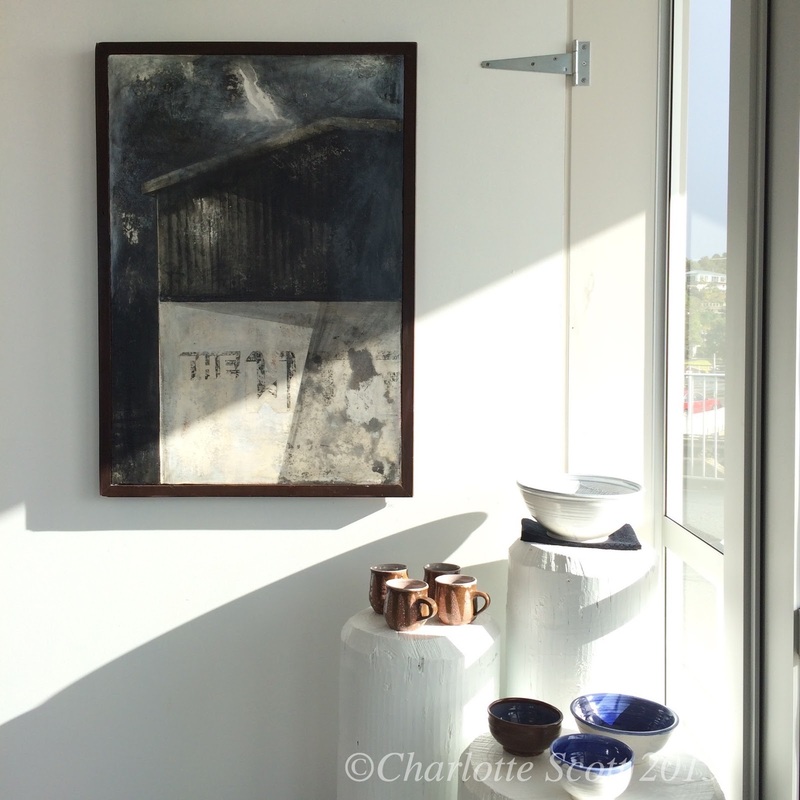 The artwork is graphite on gesso, a chiaroscuro work by Chris Wilkie. The pottery is by Peter Yeates. I have some very talented artists exhibiting and hopefully I'll have more soon. I want some more of the smaller items, some artisan type work as well as the fine art. More pottery by Peter Yeates. I quite like his rustic style - you can see the marks of the creator in it. This is the only photo I got on opening night! I just got far too busy talking and introducing and pouring drinks and talking some more! But now that I'm open, things have settled down a bit more. I've been over every day, even if it's just for a couple of hours. I've met lots of people, all very enthusiastic for me. I have several artists lined up to show me their work and several more who I have portfolios from to organise future exhibitions. But I want more! So artists and artisans - get in touch! And here is one of the absolute best bits about the whole space - my new design wall. After opening night, I rearranged the space a little to set up my sewing machine, my cutting and pressing table and my batting-covered, polystyrene design wall. Bliss! I think I've been more productive in the past week than I have in the last month just from being in a space that is set up purely for creativity. There is still lots to do. More signage, more advertising, more paperwork. But I'm getting there. And just so, so happy to be be on the journey. 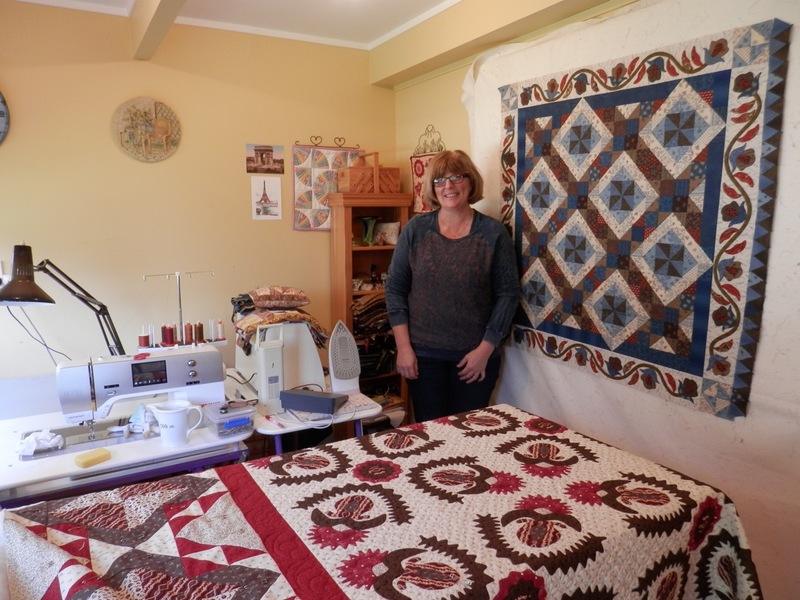 Sharon Keightley, of Pine Valley Quilts, is a blogger, quilter and pattern designer. Sharon adores reproduction and vintage fabrics and she creates beautiful quilt designs that usually incorporate both piecing and appliqué. 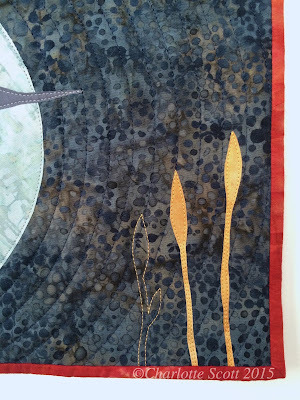 Sharon has previously taught classes on her appliqué techniques and she generously shares her knowledge of all things quilty on her blog. 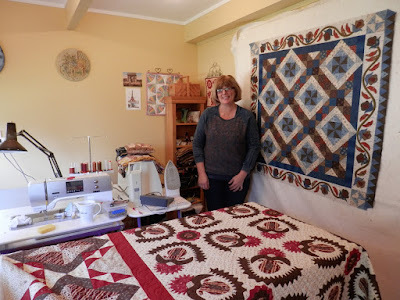 Even though our styles differ greatly, I think Sharon's quilts are just beautiful and I always enjoy reading her process posts. You can find Sharon on Twitter, Facebook, and Instagram and her website is comprehensive with a shop offering PDF patterns for download plus Sharon's informative blog. From July Sharon is also offering something new and exciting for her. 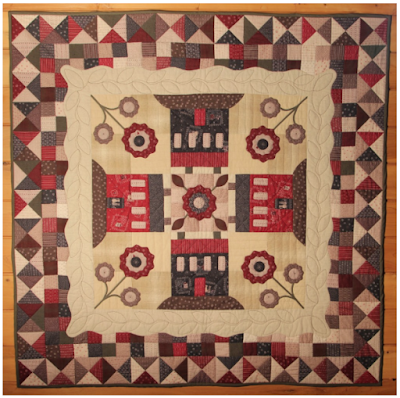 My Home Town Quilt will be running as a free block of the month for six months. Here's the quilt, an exclusive design by Sharon, so head over to her website to download the first set of instructions. Sharon and I talked about the business of pattern writing and selling and how she found her niche. We discussed her evolution into designing and how her creative process works, along with lots of information on the 'how-tos' as well. I had a great time talking to Sharon and I think you'll enjoy our talk too. So have a listen and go visit Sharon over at Pine Valley. You won't be disappointed!